A detail from a portrait of William Dalton in later life. William Dalton was born in the country district of Kilcoo, County Down in the North of Ireland in 1801. After ordination he held a curacy in Kilcoo and also became Chaplain to Lord Roden at Tollymore Park. Dalton was fired with zeal and helped to found the Protestant Reformation Society in 1827 and, during a mission from that body, he visited several places in England, including Liverpool, preaching the Gospel. He met with such a favourable response that the people of Liverpool offered to build him a church, to be called St Jude’s. This appointment he was pleased to accept but continued his mission journey, visiting Wolverhampton, where he was invited to speak on behalf of the British Reformation Society in a new church, which was not as yet consecrated. He was permitted to preach a controversial sermon in the fullest sense of the word. The subject was "The supremacy of the Pope". To the invitation of the Reformers the priests of the local Roman Catholic churches responded and came forward to defend their own doctrines and to impugn those of Dalton and his friends. As may be imagined the 2,300 seats in the place, St George's, was packed to overflowing. Among the audience was a young widow, Sarah Marsh, daughter of Sam Fereday of Ettingshall. She was the heiress of the wealthy estates of The Lloyd, with lands in the parishes of Penn, Wombourne and Edgmond, which had been the property of her late husband, Richard Marsh. She was fascinated by the young ardent clergyman and invited him and his friends to dinner. In conversation Dalton was moved by her remark that in the preaching of the Gospel controversy should never be resorted to, except from absolute necessity. She also gave a large donation to their cause, which must have also impressed. At that time Dalton returned to Ireland and resigned his duties in that place, fully intending to take up the promised post in Liverpool. 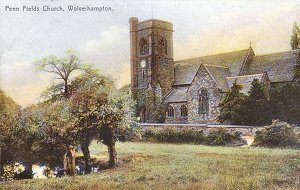 Visiting Wolverhampton a short time later, to see Sarah Marsh, he was taken aback to learn that she had offered to endow St George’s church and had asked Bishop Rider to appoint Dalton as the first incumbent. Unfortunately for this plan Wolverhampton was then a Royal Peculiar and it was the Dean (of Windsor and Wolverhampton), not the Bishop, who decided these things in the very large Wolverhampton parish. Furthermore Dalton had already agreed to accept the Liverpool position. But love was blossoming in his heart. During his many visits to see Sarah Marsh he became more and more certain that she just might find life with him attractive. Putting this to the question, he found, to his delight, a full and true response to his suggestion that she should become his wife. She made it a condition that she should return to The Lloyd for a few months stay each year until he found a permanent position near Wolverhampton. The Trustees of St Jude’s were not enamoured with the idea that they should release him from his contract and insisted that he serve them in Liverpool. Sarah agreed to this appointment, provided that they divide their time between Wolverhampton and Liverpool, spending several months each year at the Lloyd. They married in June 1831 at St James', Piccadilly and bought a home in Toxteth Park in Liverpool. In 1832 Sarah returned home, leaving Dalton to care for his flock amongst whom cholera had broken out. Meanwhile Mrs Marsh had agreed to endow a new church in the chapelry district of St John, at that time a chapel–of–ease to St Peter’s, and to place a faithful minister in charge. The work had scarcely begun on this church when the Trustees of St Paul’s, as it was to be named, were distraught to learn that their intended minister had embraced Irvingism and would just not do for them! At the same time by fortunate coincidence, a great friend of the Daltons, Dr McNeil, Rector of Albury, was in conflict with his patron. Dalton, who seems a man who never lost an opportunity when it presented itself, at once asked Dr McNeil if he would like to take over his Liverpool church. Mrs Dalton then solved St Paul’s problem by 'suggesting' that her husband be appointed. This was an arrangement to the satisfaction of all - St Jude’s would now have a man whose heart was not away in Wolverhampton. So William Dalton became the first Vicar of St Paul’s, a living that he held from 1835 to 1859. He was appointed Rural Dean of Wolverhampton in 1857 and a Prebend of Lichfield Cathedral in 1856. St. Paul's church, Penn Road, eventually demolished for the building of the Ring Road. The two turrets of St.Paul's can be seen in the distance in this early 20th century view of Penn Road - a very urban area compared to Penn. Despite the reluctance of the Deanery and Royal Peculiar of St Peter’s, who could see their influence being chipped away; a further five town churches were built during the Rev. Dalton’s time at St Paul’s, and he had a great influence in this programme. St Mary in Stafford Street (1842), St James in Horseley Field, St Matthew in Walsall Street (1848), St Mark in Chapel Ash (1848) and St Luke in Blakenhall (1860), were all built with money and advice from Mr and Mrs Dalton. 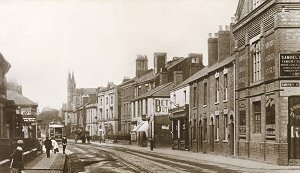 Prebendary Dalton achieved a goal in 1848 when the Deanery was suppressed and St Peter’s was established as a rectory. Henceforth it would be the Bishop, and not the absentee Dean, who would make the decisions in the town. The parish of Penn was receiving an influx of the wealthier townsfolk, particularly in the district of Upper Penn, which is situated some distance from the village church of St Bartholomew. 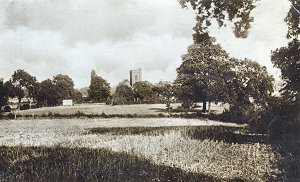 Mr W. H. Sparrow offered to provide just over and acre of land in "The Cloddy Mere" for a new church in Upper Penn and the Dalton’s contributed £3,000 in return for the patronage. An Order in Council made in September 1859 assigned the new church of St Philip as a district chapel to the parish of Penn. This tinted postcard, from about 1900, shows the still rural location of St. Philip's Church. 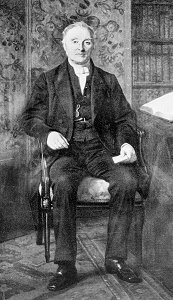 The Rev William Dalton, until then Vicar of St Paul’s, now made the decision to take the church himself and was licensed as Perpetual Curate of St Philip’s on 21st October 1859. Interestingly he was not 'instituted', being already the Patron, but he is recorded as having ‘read himself in’ on 23rd October. Dalton was not a narrow, blinkered clergyman, intent purely with his own parish. He formed a local Clerical Society, which consisted of all the neighbouring clergy, who met regularly at The Lloyd. Day Schools were founded at most of the town churches and he and his wife went on to help in the building of three further churches in the town. These were, St Jude’s (1869) in Tettenhall Road, St Andrew's (1870) in Whitmore Reans and Christ Church (1877) in Waterloo Road. This postcard, from the first half of the 20th century, shows St. Philip's, probably from near Oxbarne Avenue. Dalton was also Chaplain of the Orphan Asylum, which he helped to found in 1850. This was at first intended for boys under the age of 14 and was sited in the Old Dispensary in Queen Street. The founder, Mr Lees, a local lock manufacturer, then purchased, in 1852, two and a half acres of land at Goldthorn Hill, for a building to accommodate 50 boys and 30 girls. This building was to become the Royal Orphanage in 1900. Greatly enlarged it is now The Royal School. 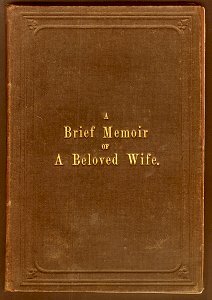 The cover of the memoir Dalton published of his wife. On 19th February 1862 Mrs Dalton died after a long and painful illness. By her will, The Lloyd and its Penn and Wombourne estates were left to the Rev Dalton for life. The Muchall estate went to the Rev John Evans and the Shropshire lands at Poulston went to her nieces and nephews, to whom the Lloyd was to revert after Dalton’s death. But William Dalton was not finished! 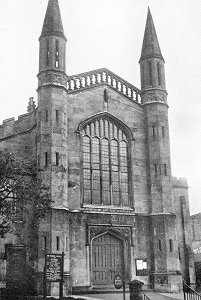 Mr Beckett of Penn remarks in his diary on Jan 18th 1864: "The new Schools attached to St Philip’s Church were formally opened today and presented by the Subscribers to the Rev W Dalton in Trust and as a Memorial to the late Mrs Dalton". June 1864 finds Mr Beckett again noting: "A memorial window was placed in St Bartholomew’s Church to the memory of the late Mrs Dalton, at the expense of the Tenants of the Lloyd Estate". The 16th June 1864 finds Mr Beckett remarking that: "The Rev William Dalton was again married to a Miss (he got the name wrong) a Bedfordshire lady half his own age. A little of the old leaven remains, perhaps." Indeed Mary Isabelle Chalfont, of Asprey Lodge, Bedfordshire, married William Dalton in St John’s Church, Paddington on that date. Together they lived at the Lloyd until his death on 13th May 1880. Dalton was childless. He lies buried in the family vault in Wombourne parish churchyard. Upon his death his second wife moved to Eastbourne, where she reminded herself of former days by calling her new home – The Lloyd. A gifted theologian, the Reverend William Dalton BD published many books and his influence is still felt in west Wolverhampton.